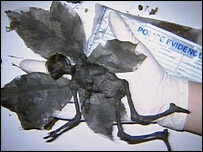 An April Fool's Day prankster has sold the mummified remains of a "dead fairy" for nearly £300. Magicians' prop maker Dan Baines, 31, from London, was flooded with e-mails on 1 April when he published pictures of his creation online. He claimed a dog walker had found the tiny corpse at Firestone Hill in Duffield, Derbyshire. Mr Baines, formerly of Derby, later admitted it was a hoax, but sold the fairy on an internet site for £280. An account on his website read: "The 8in remains, complete with wings, skin, teeth and flowing red hair, have been examined by anthropologists and forensic experts who can confirm the body is genuine." Conspiracy theorists did not believe him when he admitted the convincing model was a hoax, he said. He said: "There are still a lot of people who believe it's real. It's started quite a lot of conspiracy theories. One claims that the fact I revealed it was a hoax was because of government pressure to stop people digging the ground up." The model attracted nearly 40 bids when advertised on the internet and the highest at the close of the sale was made by a private art collector in the United States. Mr Baines said he had become addicted to April Fool's jokes and is not ruling out similar pranks in the future.